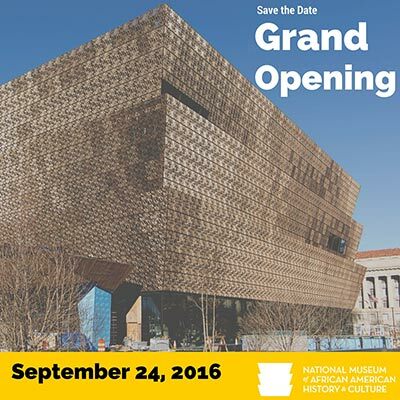 There is a new reason for class tours to visit Washington, DC when the new National Museum of African American History and Culture opens September 24, 2016. The newest addition to the sprawling Smithsonian complex in Washington has been several years in the making with a budget of over $500 million . It was established by Act of Congress in 2003, following decades of efforts to promote the history and contributions of African Americans in the United States. According to its website, to date, the museum has collected more than 36,000 artifacts. It is the 19th museum of the Smithsonian Institution. The museum’s collection is vast and covers virtually every aspect of the African American experience from slavery through the civil rights era to current events. According to the museum director, the goal was to share the full experience of black America. Featured exhibits included a Thomas Jefferson display with a wall of bricks each etched with the names of slaves he owned in his lifetime. The museum is 350,000 square feet with 10 stories (five above and five below ground). It’s vast collection includes over 33,000 artifacts includes areas covering segregation, clothing and dress, music, sports, literature, politics and much more. This new addition to the Smithsonian is a must for any class trip to Washington, DC. Students will learn and be inspired by the beautiful architecture of the building, prominent five-acre location on the National Mall and a wealth of information covering every aspect of African American history in the United States. Educational Tours is organizing trips now for the 2016-17 student travel season. Don’t miss this opportunity to make your class one of the first to experience the newest cultural attraction in Washington, DC. Keep in mind the museum is likely to take “timed” entries only for group tours so it’s important that teachers interested get their tours booked now. Learn more about the National Museum of African American History and Culture, and contact us for tour options. Enter your email address and click Subscribe to receive notices of new stories.